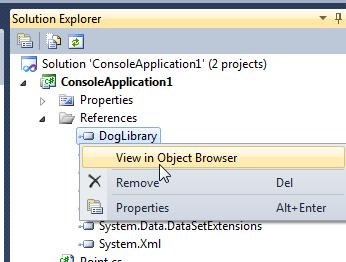 You can use the Object Browser in Visual Studio to get information about types and their members. Typically, you’d use this to get information for types in an assembly that you did not author. 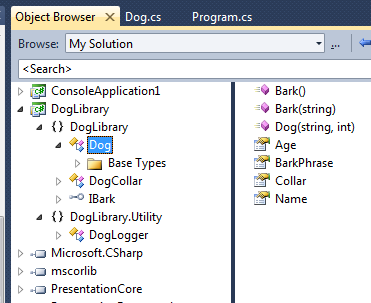 In the example below, we right-click on the DogLibrary assembly, which the ConsoleApplication1 application references and select View in Object Browser. 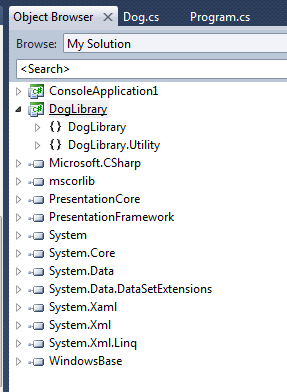 Once the Object Browser window opens, we can see that the DogLibrary assembly contains types in two namespaces–DogLibrary and DogLibrary.Utility. We can expand either of the namespaces to see the types that it includes and then click on a type to see its members.